You don’t need validation that you’re a sharp dresser. You don’t. But, on some level, part of you just wants some reassurance that you’re ready to face the world looking your best. Tapping into that deep-seated insecurity … uh, desire to look your best, Amazon is releasing a new member of the Echo family called the Echo Look. 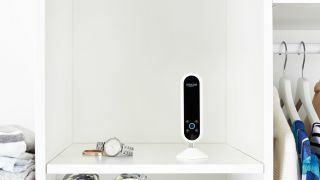 Part wide-angle camera, part style guru, the Amazon Echo Look snaps a full-length photo of you in the morning, allowing you to see what you look like on your phone, and then uses computer learning to tell you how good you look. How does the Look know the difference between what’s hot and what’s not? The Look’s depth-sensing camera blurs out the background of the image, focusing on you and the clothes you’re wearing. Once it has two pictures of you wearing different outfits, you can submit them to the Style Check algorithm. This takes into account fit, color, styling, and current trends and gives you feedback as to which outfit has more visual pop. If you get the thumbs up, you’re ready to go out and conquer the world with your Vogue cover shot-worthy outfit. If not, the Look might refer you to its online store where you can shop for new, Amazon-approved duds. So Amazon’s judging you? Yes. Yes they are. It’s not hard to put two and two together here. Amazon owns a fashion section of the website. You might not always feel good about the way you look and want to improve your style. Amazon kills two birds with one stone by providing you with a smart style assistant who just so happens to be tapped into the e-tailer’s marketplace full of great-looking clothes. But setting aside the Look’s slightly duplicitous nature, it has real potential to be a handy little guide to putting together a unique look each morning. Another advantage of the Look is that when it’s not doling out the fashion advice it works just like an Amazon Echo Dot, which means it can tap into other smart home devices or answer queries in between fashion shows. Unfortunately, however, the Amazon Echo Look is only available to VIPs only. Like the launch of the original Echo, Amazon is selling the Look on an invitation-only basis. Should you get the invite, though, the Look will set you back $200 (around £150, AU$270).